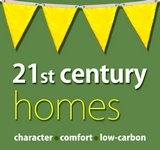 Planning has started for the Muswell Hill 21st Century Homes event taking place on 2/3 February 2013. Following the huge success of the 21st Century Homes event organised by the Highgate Society in September, we’re bringing the same format to Muswell Hill. On Saturday afternoon we’ll have a conference and exhibition at the Muswell Hill Methodist Church and on Sunday we’ll have tours of local houses. You can find out more by clicking on the 21st Century Homes tab at the top of the page, which we’ll keep updating as the event shape up!